I won a trip to France for the final of the Tour de France this year. Taking advantage of this unexpected windfall my wife and I decided to tack on some extra days to trip visit some of battlefields in that part of the world. She's an Aussie and I'm a Kiwi (although I've now spent more of my life in Australia than in NZ) so, after a couple of days in Normandy, we spent 4 days trying to focus on the ANZAC sites in France and Belgium. Obviously that's not really enough but I was surprised on how much we did fit in as most things are very close together. So if you're interested I'll post some photos. I'll do it the order we travelled. I've ignored Normandy in this thread because it's WW II, there is no direct ANZAC stuff there, and we went to the American sites mainly (perhaps I'll do that in another thread if anyone is interested). As there were 5 Australian Divisions and only 1 NZ division on the western front it may appear that this thread has more Australian content as opposed to Kiwi stuff. The text below is from the Commonwealth War Graves Page for the Adelaide Cemetery. Villers-Bretonneux became famous in 1918, when the German advance on Amiens ended in the capture of the village by their tanks and infantry on 23 April. On the following day, the 4th and 5th Australian Divisions, with units of the 8th and 18th Divisions, recaptured the whole of the village and on 8 August 1918, the 2nd and 5th Australian Divisions advanced from its eastern outskirts in the Battle of Amiens. Adelaide Cemetery was begun early in June 1918 and used by the 2nd and 3rd Australian Divisions. It continued in use until the Allies began their advance in mid August, by which time it contained 90 graves (the greater part of the present Plot I, Rows A to E). After the Armistice a large number of graves were brought into the cemetery from small graveyards and isolated positions on the north, west and south of Villers-Bretonneux and they were, without exception, those of men who died in the months from March to September 1918. There are now 960 Commonwealth servicemen of the First World War buried or commemorated in this cemetery. 266 of the burials are unidentified but there are special memorials to four casualties known, or believed to be buried among them. On 2 November 1993, following a request by the government of Australia, an unknown Australian soldier killed in the First World War was exhumed from Plot III, Row M, Grave 13, and is now buried in the Australian War Memorial in Canberra. Some shots of the Cemetery. Nice photos Calum, thanks for posting. Next was the Australian National Memorial at Villers-Bretonneux. We did try to go to the Victoria school in Villers-Bretonneux but as it was the school holidays it was shut. The memorial is the Australian National Memorial erected to commemorate all Australian soldiers who fought in France and Belgium during the First World War, to their dead, and especially to name those of the dead whose graves are not known. The Australian servicemen named in this register died in the battlefields of the Somme, Arras, the German advance of 1918 and the Advance to Victory. The memorial stands within Villers-Bretonneux Military Cemetery, which was made after the Armistice when graves were brought in from other burial grounds in the area and from the battlefields. Both the cemetery and memorial were designed by Sir Edwin Lutyens. The memorial was unveiled by King George VI on 22 July 1938. Of the 10,982 names displayed at the unveiling of the Villers-Bretonneux Memorial the burial places of many have since been identified and this continues to this day; 6 of these being among the significant discovery of 250 burials which culminated in the first new Commission cemetery in 50 years being dedicated in July 2010 as Fromelles (Pheasant Wood) Cemetery. All these discoveries are now commemorated by individual headstones in the cemeteries where their remains lie and their details recorded in the relevant cemetery registers; their names will be removed from this memorial in due course. Time has also revealed more names not previously notified which have now been added to this memorial and register. There are now 10,738 Australian servicemen officially commemorated by this memorial and named within the register. Whilst the memorial is an Australian memorial the cemetery contains serviceman from all commonwealth countries. Closer, this was one of the most impressive memorial we visited. View from the tower looking down the cemetery. You can see the terrain of the Somme in this image. No real hills, no woods/forest mainily flat. One of the structures at the edges of the memorial the thing hanging from the corner is a stone Australian Flag. Not only Australians are buried here there are plenty of others. However it is rare to find serviceman from WW 2. I was obviously interested to find 2 RNZAF airmen from WW2. Great photos Calum. Sobering looking across those fields. Seeing that photo of the bullet damage to the tower reminds of when I was in London and I went to the Victoria and Albert Museum. As I got to the main entrance i saw big chips out of the wall and foundation. Ah ha I though must be from the blitz back in World War 2. Well I was half right but the wrong war! I was astounded to read on a nearby plaque that the damage was from a Zeppelin raid in World War 1. Teresa and i have a UK trip on the near horizon and look forward to seeing all this history again (along with some new sites). I remember seeing similar shrapnel damage made by a German air raid on the 4th of September 1917 during WWI on the amazing Cleopatra's Needle's accompanying Sphinx. This ancient Egyptian obelisk stands on the Thames Embankment. The sphinxs are not original Egyptian but the needle is. Amazing history of three eras right there, ancient Egypt, the Victorians who decided to nick it and take it home, and the German raids on London in WWI. 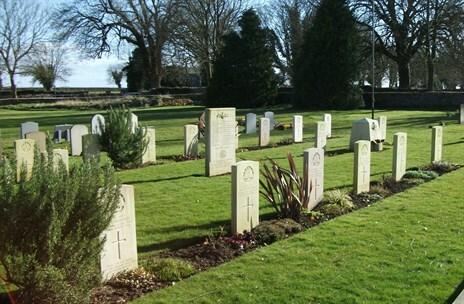 Not to piggy back this thread but as an adjunct to ANZACS buried abroad - namely Australians from the First Training Wing of the Australian Flying Corps and at the Leighterton Cemetery in Gloucestershire, lies 23 who lost their lives while training in 1918 and early 1919. We visited there on our journey through the Cotswolds via a friend who lives in and who knew the region. If you get time zip over to France/Belguim and do some of the WW1 memorials. You can do a lot in just a few days. There are heaps of tour companies that run trips if you've only got a few wasy and don't want to orgnise things yourself. I wasn't that interested in WW1 until recently but reading the book I mentioned above really added to the experience. I remember seeing similar shrapnel damage made by a German air raid on the 4th of September 1917 during WWI on the amazing Cleopatra's Needle's accompanying Sphinx. .
yes I saw that too. I wondered what the hell this thing was and why someone had been chipping bits off it........until I saw the plaque. I was there in 2000/2001, when was your trip Dave? I went for a short walk along the edge of the field opposite and found a large piece of rusty metal, which I assume was shrapnel. We did intend to go to Hamel but as it was getting late we decided to head for Albert and our Hotel (as an aside when my wife saw the Hamel memorial on TV a week ago, I was berated for not taking her there). On the way to Albert we headed past the 3rd Australia Divison Memorial (from www.ww1westernfront.gov.au/le-hamel/sailly-le-sec.php). Called ‘Operation Michael’, this massive German attack had quickly breached the British lines near St Quentin to the east. Their plan was to push rapidly westwards, capture the city of Amiens and then cut off the British armies in the north from their French allies in the south. The Germans had initially swept all before them and the British began to retreat across the famous 1916 battlegrounds of the Somme. To relieve the weary British, fresh divisions, including the Third Division, were rushed from the north to stem the German advance west of Albert. Unfortunately I hadn't done by research on this area. Just down the road is the site where the Red baron was downed...... Doh ! We were driving along a country road and spotted this plaque. This was the site of the first use of tanks in war. I'm not sure but I think the tanks were supported by NZ infantry. Correct, New Zealanders were in that battle. Wikipedia states: "The first use of tanks on the battlefield was the use of British Mark I tanks at the Battle of Flers-Courcelette (part of the Battle of the Somme) on 15 September 1916". The Lochnagar Crater, formed by the Lochnagar mine on the first day of the battle of the Somme. It is just outside of the village of La Boisselle. Each year on the anniversary on July 1st (date of the explosion which formed it and the date of the first day of the Battle of the Somme) a Remembrance Ceremony is held there. The Lochnagar mine was a mine dug by the Tunnelling Companies of the Royal Engineers under a German field fortification known as Schwabenhöhe, in the front line, south of the village of La Boisselle in the Somme département of France. The mine was named after Lochnagar Street, the British trench from which the gallery was driven. It formed part of a series of eight large and eleven small mines that were placed beneath the German lines on the British section of the Somme front. The Lochnagar mine was sprung at 7:28 a.m. on 1 July 1916, the first day of the Battle of the Somme. The crater was captured and held by British troops but the attack on either flank was defeated by German small-arms and artillery fire, except on the extreme right flank and just south of La Boisselle, north of the new crater. The crater has been preserved as a memorial, where a service is held on 1 July each year. The Lochnagar Crater Memorial is privately owned, having been purchased by Richard Dunning on July 1st 1978. It is supported by the superb Friends of Lochnagar who give generously of their time, effort and money to help maintain it. Another shot of the crater. Unfortunately it's hard to get a sense of scale of how big this hole is. It is almost 91 metres (300 ft)) in diameter and 21 metres (70ft) deep. This simple memorial is for Private George Nugent. His remains were found on the on 31st October 1998 when a visitor noticed what he thought were human remains emerging from the chalk. The remains were exhumed on Tuesday 3rd November 1998 . The remains consisted of a human skeleton, the skull of which was broken. Various items of army kit were found with the remains including a rifle, bullets and water bottle, as well as personal items, including a pipe mouthpiece, a silver pen holder and a folding cut throat razor. It was the razor that held the key to identifying the remains. Every soldier in the British Army was required to shave daily. Soldiers looked after their razors, and were extremely unlikely to loan it to another soldier. The razor found with the remains, had George's name and service number etched into the handle, so identifying the remains as those of Private George Nugent. I just updated the text for photo, I had another look at the image and it was the site of the first tank vs tank combat. Not the first use of tanks. OK, where did that take place then? Caterpillar Valley Cemetery lies a short distance west of Longueval on the south side of the road to Contalmaison. On the 6th November 2004, the remains of an unidentified New Zealand soldier were removed from this cemetery and entrusted to New Zealand at a ceremony held at the Longueval Memorial, France. The remains had been exhumed by staff of the Commonwealth War Graves Commission from Plot 14, Row A, Grave 27 and were later laid to rest within the Tomb of the Unknown Warrior, at the National War Memorial, Wellington, New Zealand. The Australian War Memorial owns a little piece of France – the Windmill site at Pozières. Australia’s official war historian, Charles Bean, suggested the purchase because ‘The Windmill site ... marks a ridge more densely sown with Australian sacrifice than any other place on earth’. Over seven weeks in 1916, at the Battle of the Somme, the Australian Imperial Force suffered 23,000 casualties, more than 6700 of whom died, in the countryside around the Windmill. On 11 November 1993 soil from the Windmill site was cast over the coffin of Australia’s Unknown Soldier during his funeral at the Australian War Memorial in Canberra. The windmill on this high ground was used from September 1914 as a German field artillery observation post and command post. The field looking back towards Pozières. On this field and around the windmill more Australians died than anywhere else in the war (including Gallipoli) . The Digger on water tower just outside Pozières. The names below are those who were awarded the Victoria Cross in the battles in the area. There are five Australians, one Canadian and one Brit. Fantastic thank you so much for sharing. I visit France every couple of years to catch up with family, but have avoided World War I sites as I think I would find them a bit hard to take emotionally. Having said that, I really enjoyed a tour we did of Normandy which included the main US and German cemeteries. Did you feel the need to decompress or that a pall had been cast over the holiday after visiting any of the cemeteries or other sites where there was great loss of life? Visiting the WW1 sites, whilst quite sombre was really interesting, and it certainly didn't cast pall over the trip. My wife (who's ex military as well) enjoyed it as much, if not more, than I did. This surprised me as she is not into military history at all. You do get a sense of the futility and waste of it all, but you also have to remember that things/attitudes were different back then. I found it very educational. And whilst it may seem odd I did enjoy visiting each new place, mainly because I was learning something each time. But it was also great to see how well cared for these places are and how they had been incorporated into the local community (and dare I say it, economy). It's nice to think that all those people will always be remembered, even by strangers, and even if they have no living relatives. I felt, by paying my respects at each place I visited, that was I was doing my bit to make sure their sacrifice was never forgotten (sounds corny I know). I think if you have even a minor recommend it to anyone. You don't have to do as many places as we did but if you're in the Somme or Ypres area and you have transport you can do a lot in one day.